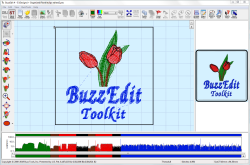 While BuzzEdit started as a simple embroidery stitch editor, it has continued to grow into a robust tool for customizing and creating embroideries! 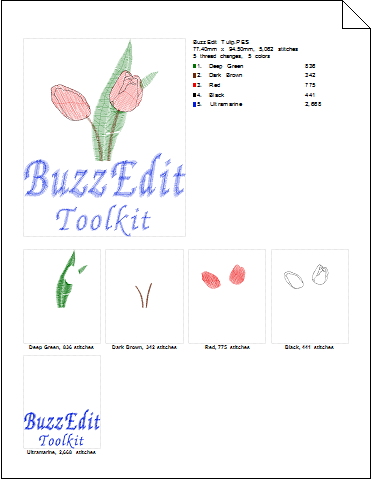 Embroidery Stitch Editing - BuzzEdit provides powerful stitch editing capabilities. Add, delete or move stitches. Updated print functions with new print worksheet function creates a detailed printout to show you color breaks for better thread selections and more efficient time at the machine - updated template includes name of design, cross hair options, better graphics and more. UPDATED formats, thread palettes and new Embroidery hoops including JEF and PES hoops. IMPROVED embroidery hoop handling with hoop rotation and the ability to hide hoops that you don't use. NEW - Works with all other BuzzEdit 4 Toolkit products. Save designs in 13 popular home embroidery formats. Import 22 formats. Simplified Custom Hoop Layout - Choose your hoop, enter the dimensions of your design and all calculations are done for you. Change object attributes such as fill pattern, stitch density, pull compensation and more. 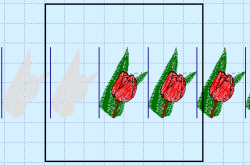 Optionally add additional needlepoints or feather edge to soften the point of overlap. 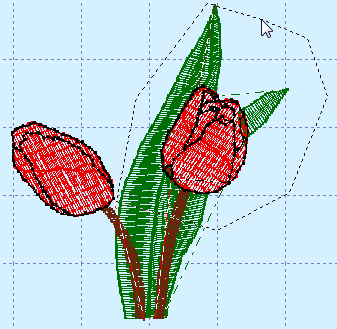 Automatically Add Basting Stitches to single or multi-hoop designs. Visit the BuzzEdit Education and Support page for more information about BuzzEdit. Here are just a few sample BuzzEdit screens and reports. Click on any screen to view it full size. Click on the X to close the model window and return to this page. The BuzzEdit workspace give you a realistic 3-D preview of your designs, a spatial workspace window and the patented Stitches-in-Time windows which give you insight into how your designs stitch in time. Using the Slice Tool you can quickly cut out specific areas of your design and save them as new designs. It's a great way to create complementary designs for a project. We saved this flower from our bee design and used it to create the wreath and border designs below. The Create Wreath Wizard allows you to create an abundance of embroidery designs from frames, labels, wreaths and snowflakes. Choose the shape, number of repeats as well as other options for a unique and beautiful wreath that is all your creation! The flower element from our design makes a lovely complementary design. By making a few selections with our flower design, we have created a beautiful floral wreath. 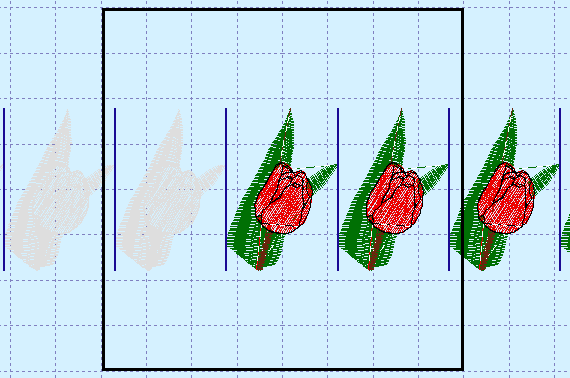 The same embroidery design can be used to create a repeating border. The Border Wizard automatically adds alignment stitches so that your border designs stitch correctly at the machine. The printed worksheet is the perfect reference at your embroidery machine. Print a worksheet of your embroidery design for all the information needed at the embroidery machine. Use the placement template to ensure exact design placement on your project. Print placement templates for regular and multiple position hoops (built in or custom). These allow for perfect placement every time. For automatic Graphic to Embroidery design generation, purchase Buzz-2-Stitches software. The following comments were submitted by users of BuzzEdit. We'd love to include yours! Submit your comments now! I absolutely would not get as much use out of my embroidery machine if I didn't have Buzz Tools software. 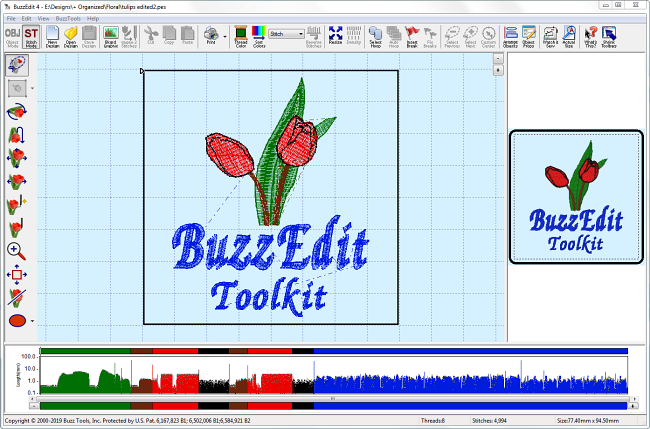 Buzz Edit with Buzz Size installed allows me resize, change colors, change stitch density, remove parts of a design, print a template for placement, etc. I just couldn't do without it. By using the template I can place it exactly in the right place in the hoop. I use BuzzEdit constantly to help me in my designing and editing for my creations that feature on my website. It is simple and fast to use. Actually it inspired me to expand on my ideas for designs. I could not do without BuzzEdit and BuzzSize Then you come to Buzz-2-Stitches -- Just amazing. This program sends me into a designing frenzy, as shown on my website. Love them ALL...Thanks Buzz Tools. 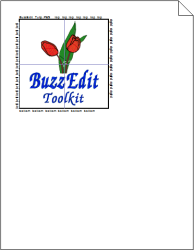 I digitize with many different digitizing programs, but I always finish off designs with BuzzEdit. If it's a JEF design my three digitizing programs will produce a JEF design but not one of them will store the hoop size info. But if I open and re-save the JEF file in BuzzEdit, the resulting design does indeed contain the hoop size info. That's true of several other formats as well.. one of the few that will. Thank Goodness for BuzzStuff. Buzz Edit is not just for the Hoop-It-All. I have both a Designer 1 and a Brother 300S. I use two different computers so my dongles are always on the other machine. I have set my computer to open all designs into Buzz Edit. I use it to easily see which color is which, the color order, how the design stitches, and the best of all the ability to reverse stitch order to have fills sew from top to bottom or left to right in one direction. It is wonderful to be able to check out the design and fix it all in one program. It is my favorite program and I wouldn't be without. It is the most necessary program for embroidery. Also, the updates that keep the program current is so responsive. Thank you for a great product. Just wanted to share a tidbit with y'all. I'd been working diligently with PE Design Version 4 Photo Stitch and just couldn't get some of the color areas to break. . . . I didn't want my grandson's eyes to be the same color as his hair! It was a breeze changing the colors in BuzzEdit. . . . .a terrific supplement to any digitizing software package >I'm sure - but a real bonus when working with Photo Stitch! throughout Alabama and surrounding areas. 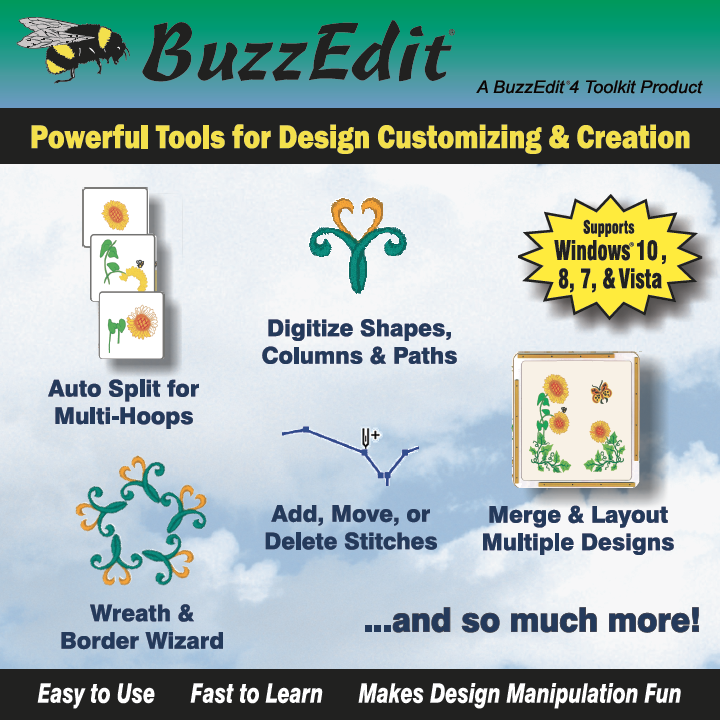 BuzzEdit is the most powerful, yet easiest to learn design editing program on the market. Every aspect of editing has been considered, from stitch density manipulation, to multi-hoop designs. A well-written manual plus plenty of online support caps the deal for me. Lisa Laufer has taken an embroider's approach to developing the finest software available. Thanks, Lisa, keep up the great work! BuzzEdit is wonderful! Thank you so very much for creating it and making it available to us all. 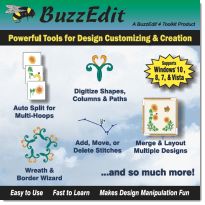 As an embroidery designer I find BuzzEdit invaluable for editing my multi-hoop designs, i.e. Pfaff Big Hoop & Hoop-It-All's Giant Hoop. It helps me to make sure my multi-hoop designs will fit together properly without the previous trial and error method. 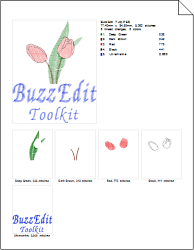 With BuzzEdit I can see how the designs fit together and make any necessary adjustments immediately. 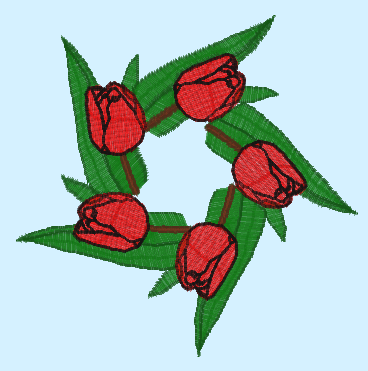 BuzzEdit also helps me to create an excellent visual aide to show my customers how to embroider and assemble my Giant Hoop designs. Until I sat down with the BuzzEdit manual I didn't understand how the 'Stitches-in-Time' feature worked. All I can say is WOW! I use it all the time now. What a wonderful time saver. Thank you again. I can't wait to see what wonderful program Buzz Tool's developers next! Editor’s Note: Patti is an award winning machine embroidery designer and digitizer. I can not stress enough how much I treasure Lisa Laufer's software program, Buzz Edit™. When I first sat in on her class at MEEC 2000 watching her demonstrate this program I couldn't believe what I was seeing. I had heard about this soon to be released program, but like others had to see it for myself. BuzzEdit™ did everything I was told the program would do and more. Of course I had to purchase mine right away. I wasn't going to leave Vegas without it and I didn't. I got BuzzEdit and the fun began. I've got a lot to learn but I have to say BuzzEdit is rated AAAA+ in my book. I looked into BuzzEdit because my husband had bought me a Giant Hoop-It-All as a gift. I was just overwhelmed by trying to layout designs for it without supportive software. I discovered Buzz Edit was not hard to learn. It is not only perfect for laying out designs for the Giant Hoop It All, but I also enjoy using it for all of my editing jobs. 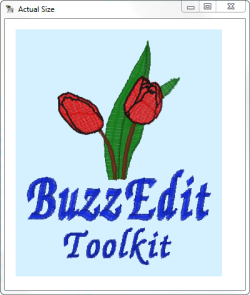 Editing with BuzzEdit is either quicker and easier than with my machine specific software, or possible where it had been impossible! I am thrilled with Buzz Edit. When I received the Giant Hoop-it-All, for my Viking 1+, I purchased this program. I am so pleased with the ease of the editing capabilities . It is an excellent compliment to the other programs I have.